State and federal agencies provide a wealth of data from routine air monitoring, local water testing and soil surveys. Below are resources providing information on the Calvert County environment. 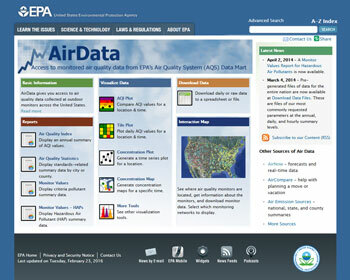 A wide variety of air quality data is available at https://www3.epa.gov/airdata/. Information related to Calvert County can be found in the Reports section or the Visualize Data section. Information in Reports includes charts and tables along with downloadable PDFs and spreadsheets. The Visualize Data section offers user-friendly maps and graphics that plot various pollutants over time. For both types of information, the site includes drop-down boxes allowing viewers to choose pollutants, calendar years for the data and the geographic areas covered. Note that some pollutant data is not available for Calvert County. In these cases, the closest data set is for Prince George’s County. 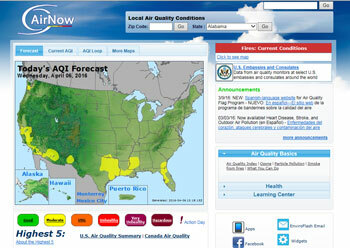 Air quality index information is available at https://www.airnow.gov/. Enter the ZIP code or state in the boxes at the top of the page to view local data. 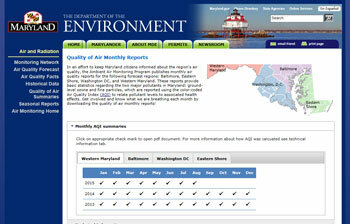 Detailed monthly air quality index reports can be found as part of Maryland's Ambient Air Monitoring Program. Calvert County data is included under the Washington, D.C. tab. 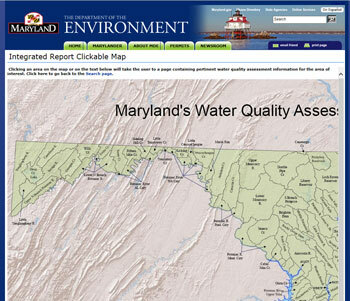 The Maryland Department of the Environment maintains an Integrated Report Water Quality Assessments map categorizing water quality for a variety of pollutants. Zoom in to view Calvert County's waterways. The U.S. Department of Agriculture offers an interactive map with detailed descriptions of soils. 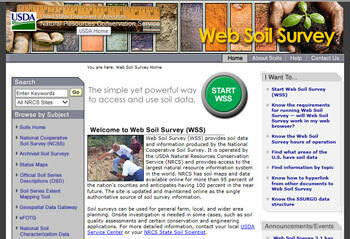 The Web Soil Survey home page includes a step-by-step guide to using the map and generating reports.